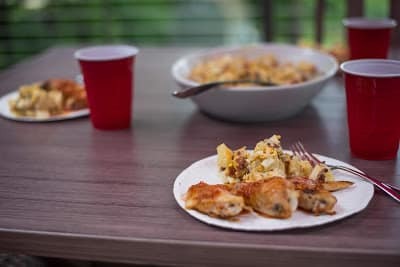 Take a page from Uncle Sam’s cookbook and try these Firecracker Wings at your Fourth of July celebration. Roasted to perfection in our Patriotic Roaster, there’s no better way to show your love for the red, white, and blue! Make the garlic-chili sauce by combining the chili sauce, minced garlic, and chili powder. Spice to taste and set aside. In a large bowl, combine water, salt, ¼ cup of the garlic-chili sauce, and ¼ cup of honey. Stir until salt and honey are completely dissolved. Add the wings and chill for 30 minutes or up to 4 hours. To make the basting and dipping sauce, combine the remaining chili garlic sauce, soy sauce, sweet soy sauce, sriracha, remaining honey, vinegar, lime juice, and ginger in a small bowl and mix well. In another small bowl, combine 1 tablespoon cold water and 1 tablespoon cornstarch and whisk together. Add to the sauce slowly until desired thickness is reached. Set aside half of the sauce for serving to avoid contamination. Drain wings and season them with sea salt and pepper. 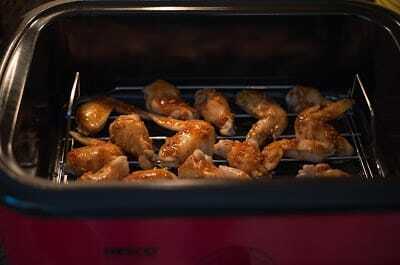 Place the wings on the rack inside the roaster, baste them with half of the sauce, and reduce the heat to 350°F. Roast until the internal temperature of the chicken reaches 160°F for approximately 25-30 minutes. 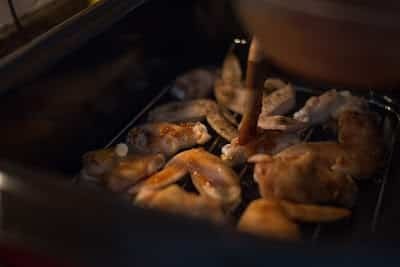 Remove the chicken pieces with a pair of tongs to a serving platter. Let the chicken pieces rest, loosely covered with aluminum foil, for 5-10 minutes before serving. 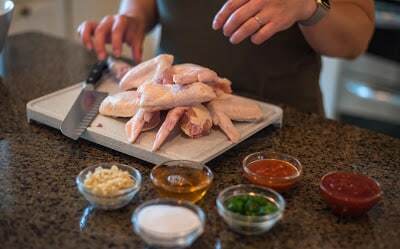 Garnish the wings with lime and cilantro.